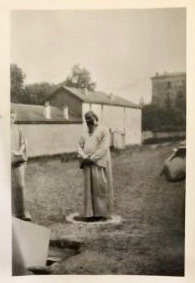 On September 13, 1926, during a celebratory laying of the cornerstone of the Universel, its founder, Pir-o-Murshid Inayat Khan stood in a circle drawn by one of his students to indicate his place for the event. Did he feel hesitant as he stepped into that circle, recognizing its symbolic significance of completion? He was to leave for a visit to India shortly thereafter. Who would have foreseen that six months later, on February 5, 1927, at age 44, the beloved teacher would pass from this earth? A seemingly small portion of his vast legacy, the cornerstone for the Universel lay in the orchard opposite his home in Suresnes, a suburb of Paris, France. What would the future hold for the unfoldment of the nascent Universel? Sixteen years earlier to the day, the young Inayat, already a renowned master of Indian classical music honored as Tansen, a title given him by the Nizam of Hyderabad in his home country, had set sail for the west. He had received a comission from his Sufi teacher in India to unite East and West in the harmony of his music. “I was transported by destiny from the world of lyric and poetry to the world of industry and commerce, on the 13th of September 1910. I bade farewell to my motherland, the soil of India, the land of the sun, for America the land of my future, wondering: “Perhaps I shall return some day,” and yet I did not know how long it would be before I should return. The ocean that I had to cross seemed to me a gulf between the life that was passed and the life which was to begin. I spent my moments on the ship looking at the rising and falling of the waves and realizing in this rise and fall the picture of life reflected, the life of individuals, of nations, of races, and of the world. I tried to think where I was going, why I was going, what I was going to do, what was in store for me. “How shall I set to work? Will the people be favourable or unfavourable to the Message which I am taking from one end of the world to the other?” It seemed my mind moved curiously on these questions, but my heart refused to ponder upon them even for a moment, answering apart one constant voice I always heard coming from within, urging me constantly onward to my task: “Thou art sent on Our service, and it is We Who will make thy way clear.” This alone was my consolation.” The Biography of Pir-O-Murshid Inayat Khan,Autobiography, p. 121, London and The Hague: East-West Publications. 1979. The message he bore of Unity and “Love, Harmony and Beauty” took root in a dynamic, industrious and increasingly turbulent land, seeding an antidote to the agitation, inequity and strife that reached a high pitch in the Great War and its aftermath. As the young musician traveled throughout North America and Europe, increasingly people wanted to know more about the source of his inspiration, the depth of his understanding of the dynamics of life, and the peaceful power that radiated from his being. Dedicated to his students and the spreading of his teachings, Inayat Khan, found himself confronting the upheavals of the time. Stories passed down from his students describe the magnetism of his being in the face of adversity. Exuding a powerful, serene presence, Inayat Khan and his American wife, Amina Begum, escaped the tumult of 1914 Russia, where he had been invited to perform. He held his new-born daughter before the border guards while their carriage raced along the road, narrowly escaping the riots. Not long thereafter he sat in deep meditation during the London Blitz, radiating an inner peace in which his students took refuge. Concerts gave way to lectures and seminars, then a school of mystical studies. Inayat Khan traveled and taught ceaselessly, offering prayers, a worship service, a vast body of spiritual teaching and practice, and more. Students gathered around him, and gifted his family a home, and the site of his Summer School, in Suresnes. Inayat Khan noted in his diary, “I was glad to notice the generous response of mureeds (pupils) to secure the piece of land intended to build the ‘Universel’.” Having created so many ways to experience the depth of Sufi teachings, Pir-o-Murshid Inayat Khan, a teachers’ teacher, rested not but gave one more way. “On the last day when Pir-o-Murshid was amongst his disciples in Suresnes, September 13, 1926, he founded the Universel, which was to be the temple of all religions. There was a grand ceremony and during it he made me, his eldest son, at ten years old, the head of the confraternity. He placed the cornerstone of that building in the meadow near our home, Fazal Manzl. You might think that the purpose of the Universel is to form a temple, like a temple of all. But as my father said, it is not a temple of stone. It is a temple made of people. This last “child” created by the Sufi sage during his time in the West lay in potentium as a cornerstone, while the tides shifted. The nurturance and maturation of the Universel came to rest in the hands and hearts of others, especially Pir Vilayat. Birthed on September 13, a day to become known as Hedjerat Day, (marking the beginning of a journey, or a new chapter in one’s life), the Universel opens the door to an ongoing voyage, a journey of discovery of unity and solidarity, of awakening conscience and consciousness, and of service in love, harmony and beauty. Experience a sunrise in nature or recall one in your imagination. 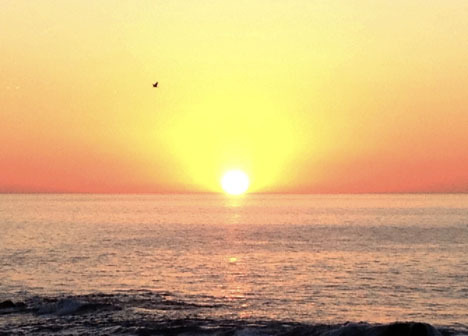 Create a gesture to greet the sun as it rises. Be very careful not to look directly into the sun, for it can damage your eyes. Regard the beauty, the majesty of the sunrise, the whole scene. Give vent to your emotion, to bewonderment. The Sufis call the sun Prince Hurakhsh, Archangel of Light. What qualities do you find in the sun? Can you feel a resonance to those qualities in yourself, and a sense of being “home” in a world of light? Allow yourself to be flooded with light. Sense the way the pores of your body, the scope of your mind and the feelings in your heart open, and your capacity for accommodating light increases. Can you feel the body’s cells jiggling, sparkling, full of life? Notice the natural rhythm of your breath. Encourage a link with the sun. As you exhale reach out toward the light of the sun. As you inhale allow light to wash over and through you. A natural response of radiance ensues. Recall that our bodies are made of sunlight, the sun itself born from cosmic unfoldment. We exist in a world of light. Revel in the wonderment and beauty dawning upon, within and around you. One could say we discover our solar inheritance. Contemplate how, in thoughts, words and deeds, qualities of light and life, encourage and illuminate people and situations: transparency clarifies the dynamics of an encounter; warmth, energy and joy nurture a relationship; a genuine smile brightens the heart of a loved one, friend or passer-by. Become aware of your position before the sun. Sense your feet on the ground. With open eyes, notice the life and light around you. Select a way to bring your realization and attunement into the day. Make a closing gesture of gratitude to the sun. The venerable Prince Hurakhsh, the most sublime of those who have assumed a body, invested with the divine countenance, sparkles rapture in the sphere of Hurqalya. Sometimes he appears in human form, sometimes as the sun, sometimes as a constellation, sometimes as a work of art or an icon. It is he who confers light upon those who meditate upon the celestial spheres. Hail to the pilgrims knocking at the gates of the high naves of the great halls of light, with righteousness and resolve, for behold the angels hasten to meet you, greeting you with the salutations of the celestial realm, and guiding you toward the Orient of Light.